Leading off today: Three straight state championships, three state New York players of the year. That's the scorecard for the Hornell football team after the announcement Wednesday by the New York State Sportswriters Association that Red Raiders three-year starting quarterback Dom Scavo has been named the state Class B player of the year. Joining him as player of the year award recipients are Bronxville running back Christian Conway in Class C and running back/linebacker Chris Nevinger of New York State Public High School Athletic Association champion Letchworth in Class D.
Complete all-star teams in the three small-school classes were also unveiled Wednesday by the NYSSWA on the RoadToSyracuse.com website. The player of the year and all-state selections in AA and A will be announced Jan. 11. Scavo won all 39 of his starts at QB, finishing his career with 3,523 passing yards and 45 TD throws in the traditionally run-heavy attack. He also ran for 979 yards and another 35 TDs. As a senior, he was 71-for-120 with 1,326 passing yards and 15 TDs. Conway piled up 1,885 yards and 33 TDs for a Bronxville squad that finished 8-1 a year after capturing a NYSPHSAA championship. He will attend Yale in the fall. Nevinger, a two-time state small-school wrestling champion (he'll continue his career at UB), rushed for 1,987 yards on 225 carries and scored 26 TDs. On defense, he made 72 tackles, with two sacks and two fumble recoveries. He finished his four-year varsity career with 5,349 yards rushing and 74 TDs. 2K twice in one night: Olean Walsh senior Ryan Whelpley joined the 2,000-point club Tuesday on the way to 27 points in a 58-40 boys basketball win over Buffalo Nichols. The 6-foot-3 forward, who moved up to the varsity in eighth grade, stands at 2,021 after 11-for-16 work from the field against the Vikings, also grabbing 19 rebounds in the win. In Western New York girls action, Marah Maycock of Randolph scored 24 points in three quarters of work during a 94-14 rout of Cattaraugus/Little Valley. That moved her to 2,013 points for her career. Troy triumphs: Troy led only once in the game, but it came when it mattered most. Senior guard Trahmier Burrell made a 3-pointer with 18.1 seconds left to give the Flying Horses a 45-43 victory over Albany CBA, ranked eighth in Class A last week by the NYSSWA. The victory snapped the Brothers’ 40-game winning streak in Big 10 play, extending back to Feb. 6, 2009 when Troy coach Rich Hurley was at Bishop Maginn. 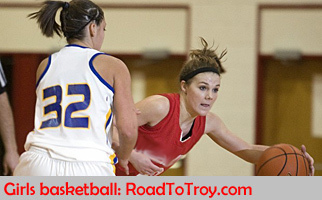 Troy missed its eight shots of the first quarter and started the second half in an 0-for-6 funk. CBA got the lead out to nine points three times in the second half. Troy 6-foot-8 power forward Kareem Brown, who returned over the weekend from a broken wrist, sat out the second half after aggravating a groin injury he suffered during practice. U-E Duals lineup: Though the field isn't as deep as in recent years, there will be a high-powered lineup of wrestling teams on hand for the Union-endicott Duals, which will be held Saturday and Sunday. Among the participating teams are Shenendehowa, which shares the No. 1 spot in the current NYSSWA rankings, No. 3 Warwick Valley and No. 5 Spencerport. Many reporters use Twitter to deliver remote updates. We track those tweets from a variety of venues 24/7. Visit the page to see what's going on. • Shenendehowa (co-No. 1), Minisink Valley (10), Brockport, Johnson City. • Spencerport (5), Columbia (13), Sayville. 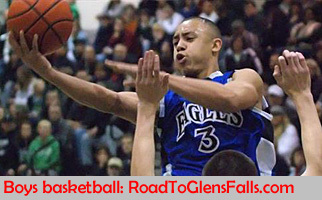 • Warwick (3), John Glenn, Long Beach, Chenango Forks. • Monroe-Woodbury (7) , Union-Endicott (co-No. 20), Clarence (co-No. 20), Half Hollow Hills West. The winner of each group advances to the semifinals on Sunday at 11 a.m.
By the way, we're doing our best to resolve the issue of having Wantagh and Shenendehowa ranked in a tie for first. They went head-to-head in a dual-meet tourney last month and finished knotted at 37-37. Wantagh was declared the winner based on criteria -- eight matches won to seven for Shen.